Apple last week launched OSX Mavericks, the free and latest version of its desktop operating system. Notably, the tech giant ditched its cat-based naming scheme in favor of one themed after California locations (Mavericks is a well-known surfing spot in Northern California). That's all fine and good, but what about the new features? More specifically, what does Mavericks bring to education? It turns out that there are two big features of particular note to educators. Along with Mavericks' lack of a price tag, the iWork and iLife product suites are also free now—with a catch. The latest versions of the two software suites are free of charge only on new devices, or if you already owned them. Otherwise, the latest versions of each program in the suites run $9.99 each. In case you don't know what these two software suites are, iWork is essentially Apple's answer to Microsoft Office, with Pages, Keynotes and Numbers serving as alternatives to Word, PowerPoint and Excel, respectively. iLife, on the other hand, includes iPhoto, iMovie and Garage Band. Let's not forget, either, that iCloud integration also allows work to begin on one device and be continued on another. A much bigger deal than the free apps, however, is that OSX Mavericks allows users to read and download iBooks on their Macs. While the e-book app has been around since 2010 for the iPad and iPhone, it wasn't available on Apple's laptop desktop computers until now. Top education publishers like Pearson, McGraw-Hill Education and Houghton Mifflin Harcourt have been producing e-textbooks for the platform for some time now, so this update provides one more place students can gain access to course materials. It might also make it that much more convenient for educators to produce their own iBooks (the iBooks Author app lets you do that). Aside from these two features, a handful of other features indirectly have uses for education. Apple's Maps app is now available on Mac and could plausibly be of use to geography and social studies teachers, and the ability to more effectively use multiple displays—each display now has its own menu bar and dock—could also be of use in a classroom environment. 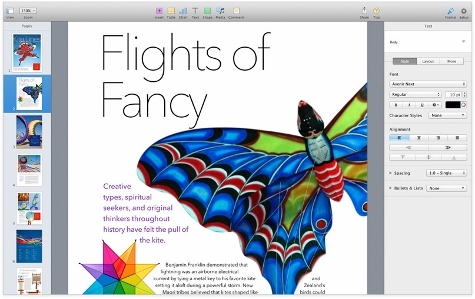 At the end of the day, though, iBooks and the two free productivity suites are the most appealing new features for education, and certainly worth giving the free upgrade a shot, so what are you waiting for? Would you like to see more education news like this in your inbox on a daily basis? Subscribe to our Education Dive email newsletter! You may also want to read Education Dive's look at what Apple's new iPads mean for education.